What’s better than a hop-on hop-off bus tour around a new city? A free walking tour. This was our first one, you know, with a guide and not Andrew reading from Lonely Planet or Trip Advisor where we should go and what we should do. I’ve become more and more appreciative of opportunities on this trip where we can hand over the reigns to someone else for a couple of hours, and this was no exception. I don’t know if this is a trend or not (being as it is my first one) but it seems as though guides for free tours are exceptionally better than guides for paying tours. Our guide, Radina was nice, knowledgeable, and made all of the historical facts and timelines entertaining! 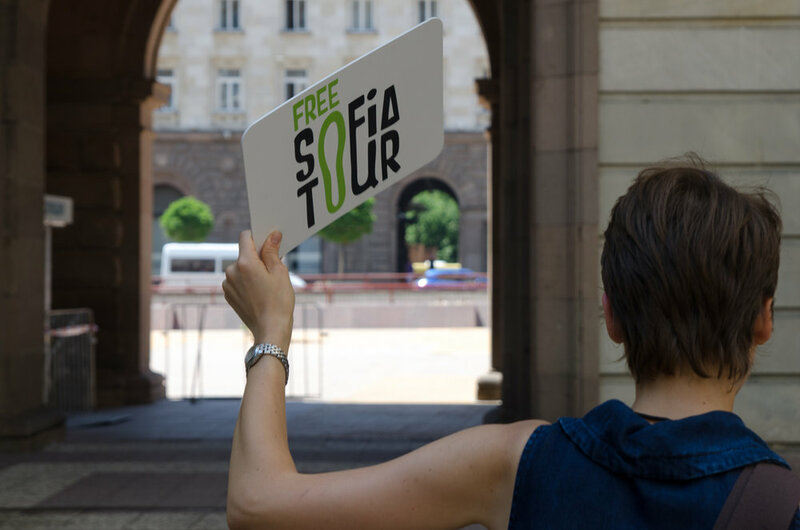 For a complete list of free walking tours around the world, check out their post on the Sofia Free Tour Blog. (They’re the free tour that just keeps giving!) You can also find them on Facebook here, if you’re interested. As always, on this trip, I find myself facing the fact that I did not pay nearly enough attention in my history classes in school. Andrew and I have talked about this many, many times. I feel like I did everything backwards. I should have gone on a trip around the world and THEN school. I would have been a much better student if I had. Now I find myself playing catch up and going down the rabbit hole of Wikipedia every other day. If I’m not looking up history, I’m looking up religion, or at least adding to the growing list of books I want to read about both and cursing the Kindle makers for pricing e-books so high. The more countries we add to our list, the more my news feed grows as well. When we first started traveling, we would send each other articles about North and South Korea. Then articles on India were added to the list. Then Palestine and Israel. Then South Africa. Lately we’ve been keeping up with Turkey, Greece, and now Bulgaria. Sometimes my head is so full, I have to clarify who is what and from where and what politics they practice to keep up (ahem, to attempt to keep up) with it all. Instead of trying to remember, and/or spend all morning looking up the history that Radina shared with us on the tour, I’m simply going to post pictures and let you enjoy. You know how to look things up on Wikipedia if you need to, right? Right. 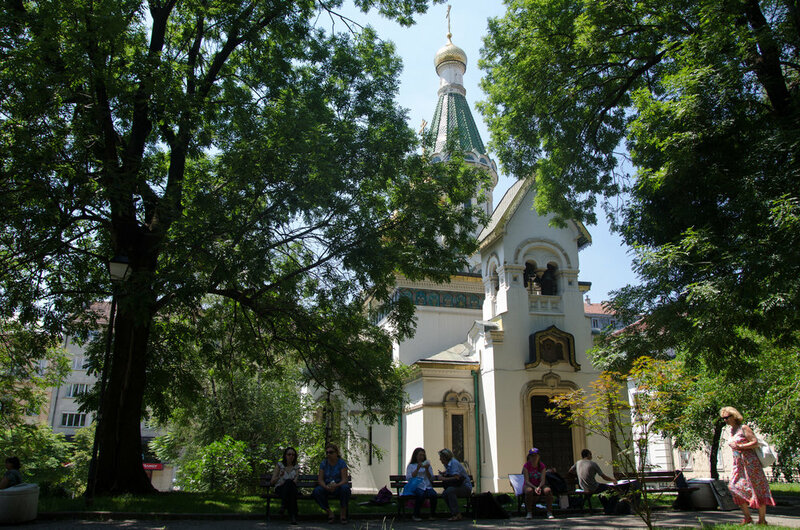 Within one square in the middle of Sofia, there were four different buildings of worship, each of a different religion, and each from a different time period. Our guide also told a fun story of how the department store (the first in the country) was also built on this square. 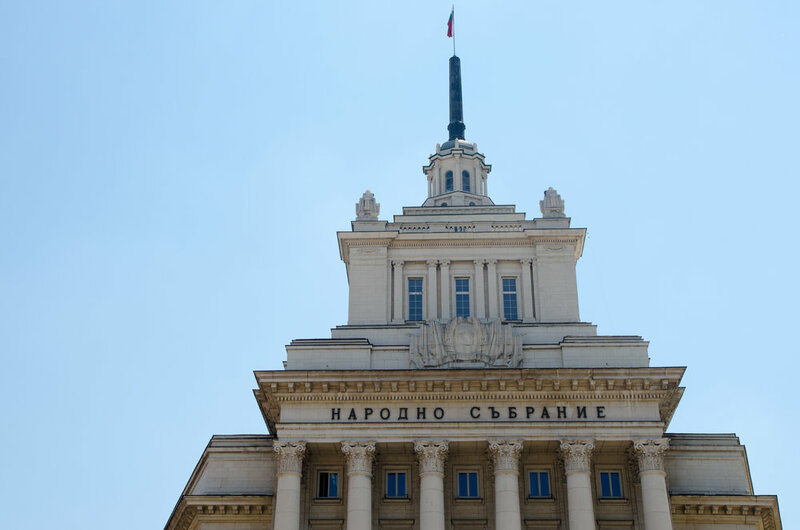 When her family would come into Sofia, she would be so excited to ride the (first, and only- if I remember correctly) escalator during communist times. When we were in Africa, we met and became friends with a lovely Romanian girl, Christina. She was ecstatic when we shared a box full of melty chocolate with her (that Andrew’s mom had sent to us in Tanzania). She told us about growing up without chocolate until one day it was available and she went crazy. Isn’t that fascinating? Can you imagine chocolate and escalators being a special thing? 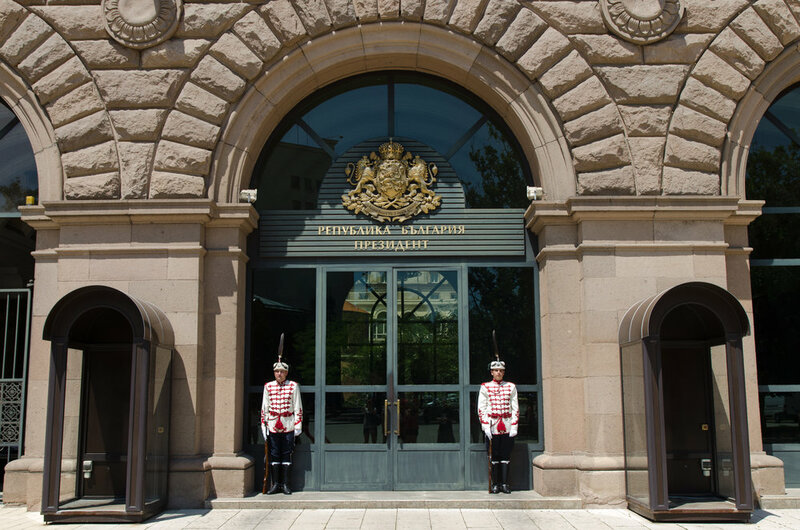 Government buildings. These poor guards were wearing such heavy, heavy uniforms. I felt bad for them having to stand outside in the HOT sun, but then we were told they change out every hour because it is so hot standing outside in the sun even for just one hour. Churches were Everywhere. The biggest, and most impressive was the Alexander Nevsky Cathedral. 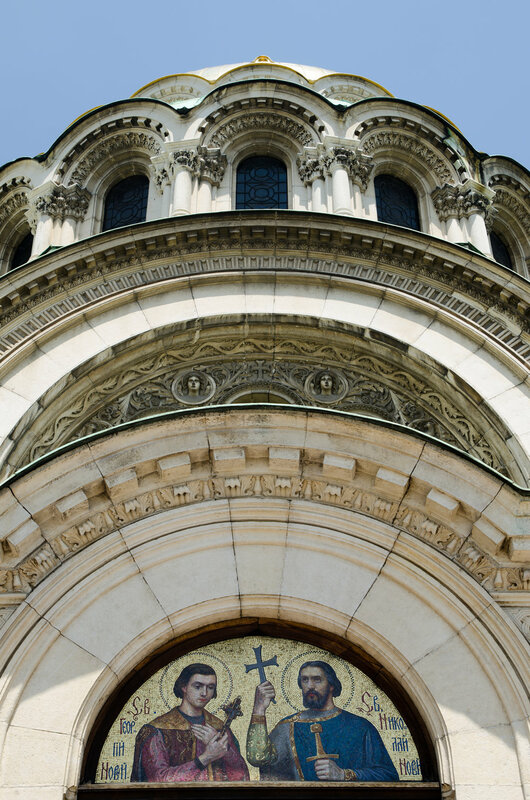 It’s one of the largest Eastern Orthodox Churches in the world. We weren’t allowed to photograph the interior, but I assure you it was equally impressive. And dark. Not many candles nor lights were lit, I’m guessing to help preserve the murals on the walls. We sat for awhile inside. To escape the heat outside, and because we’re both fasciated with religious traditions around the world. 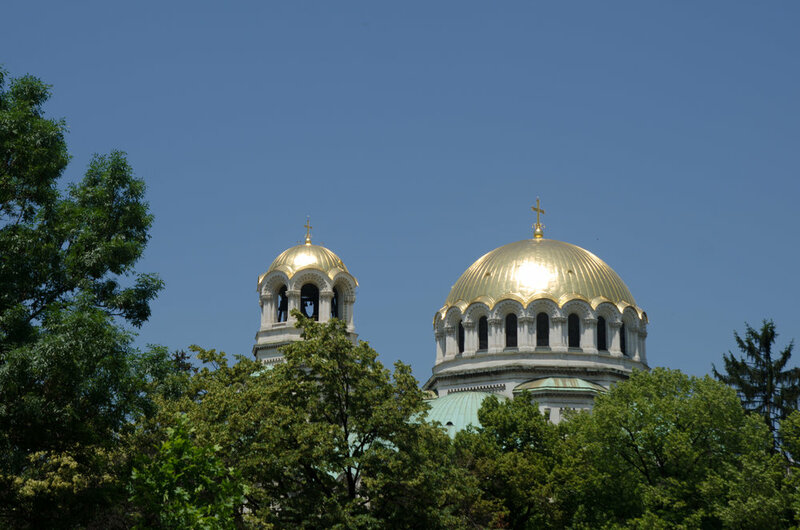 Fun fact: Sofia is not named after Saint Sofia. We were told this is a common mistake, even in Bulgaria. 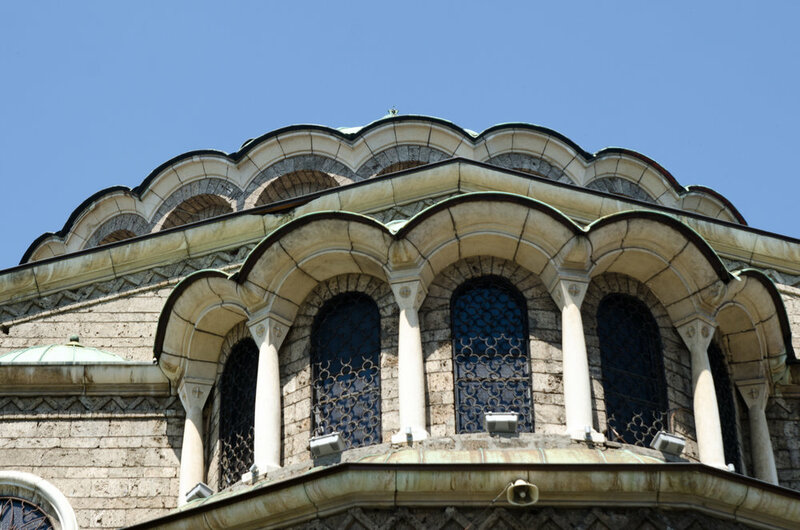 It’s named after Ayasofia, which in Greek, means wisdom. If this question comes up in your next trivia game, you’re welcome! Another fun fact (one that might not be as useful in your next trivia game): It is unbelievably awesome to have friends scattered around the world. Who knew I’d have a friend in Sofia who we could meet up for dinner with?! He ordered a mountain of food for us, insisted we try the Bulgarian rakia. When in Bulgaria… Despite having a baby on the way (update the little one was born a week after our visit) he insisted on contributing to “our cause” of trying to make it a full year (or more) around the world. So, not only are my friends leading amazing lives in foreign countries all around the world, they are generous to boot. (Thanks a million, Mark. Dinner is on us next time!) Below, he threw up the Bulgarian thumbs up and I threw down the Korean peace sign. Because we’re gangster travelers like that.